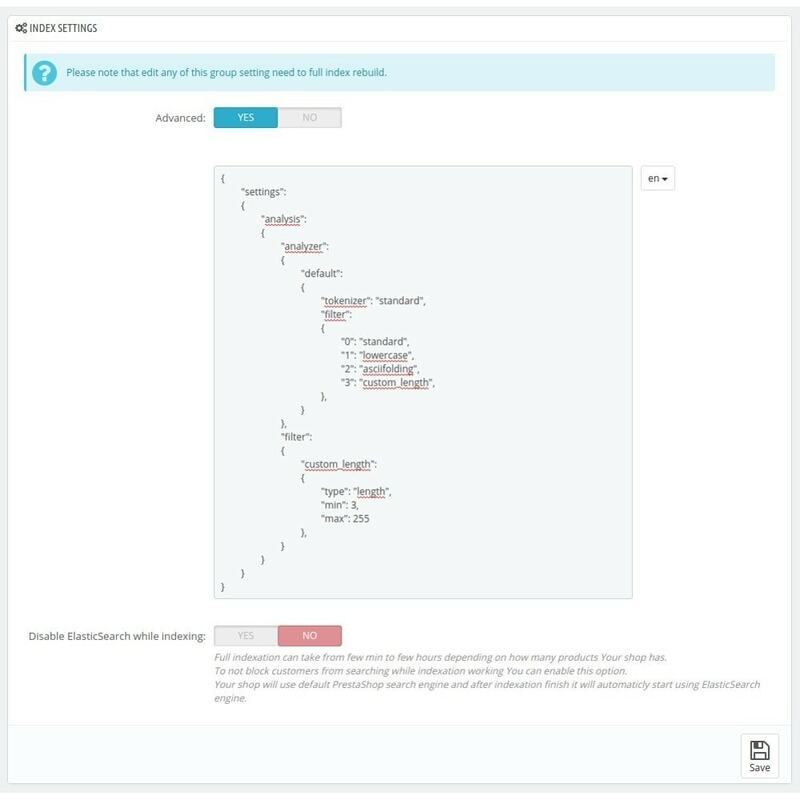 Merchant gets access to powerfull text search server features like autocomplete, stemmers, phonetic, synonyms and many many more elasticsearch features. 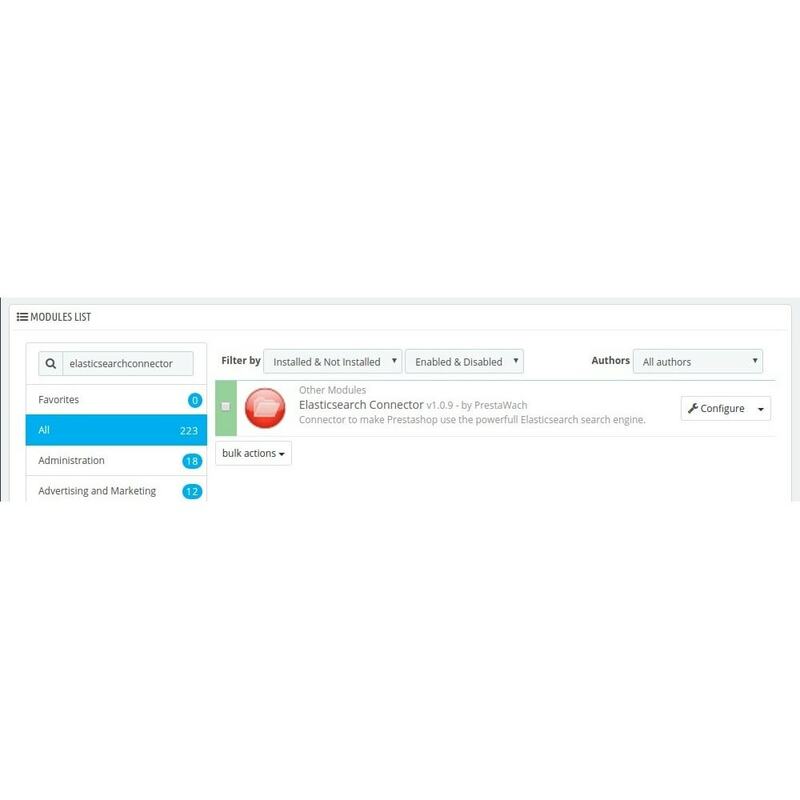 When inteligent search enabled this module will reduce number of searches done by customer that will return 0 results because of typo or misspell. 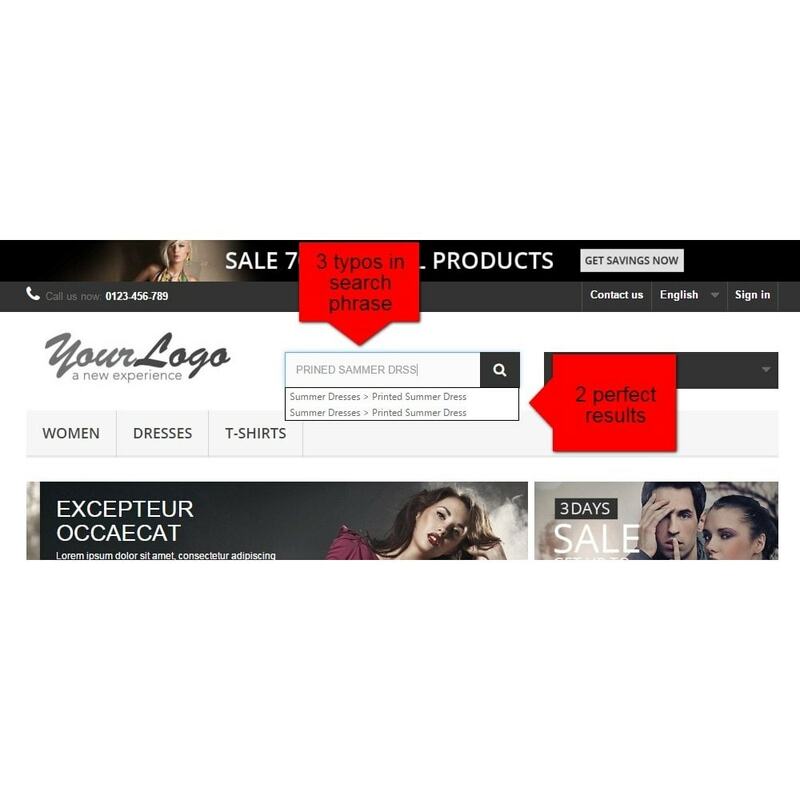 Ce module intègre une interface interactive de coupon à gratter à votre site web via laquelle les clients peuvent gratter un coupon avec leur souris pour obtenir une réduction. Une adresse mail est nécessaire pour recevoir le code du coupon. 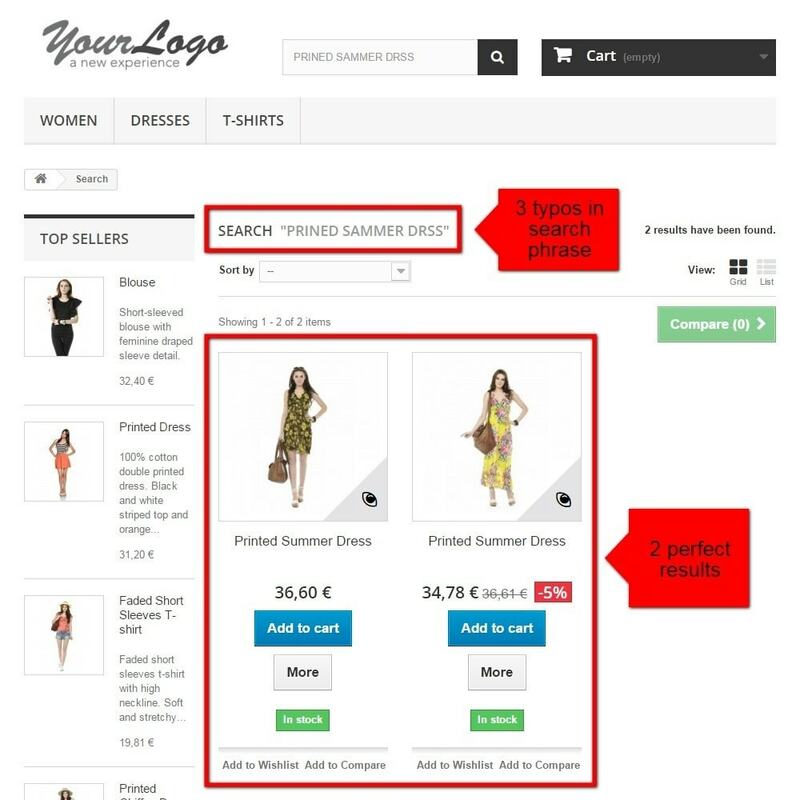 A replacement of the standard PrestaShop search functionality that dramatically improves search result quality and search speed. 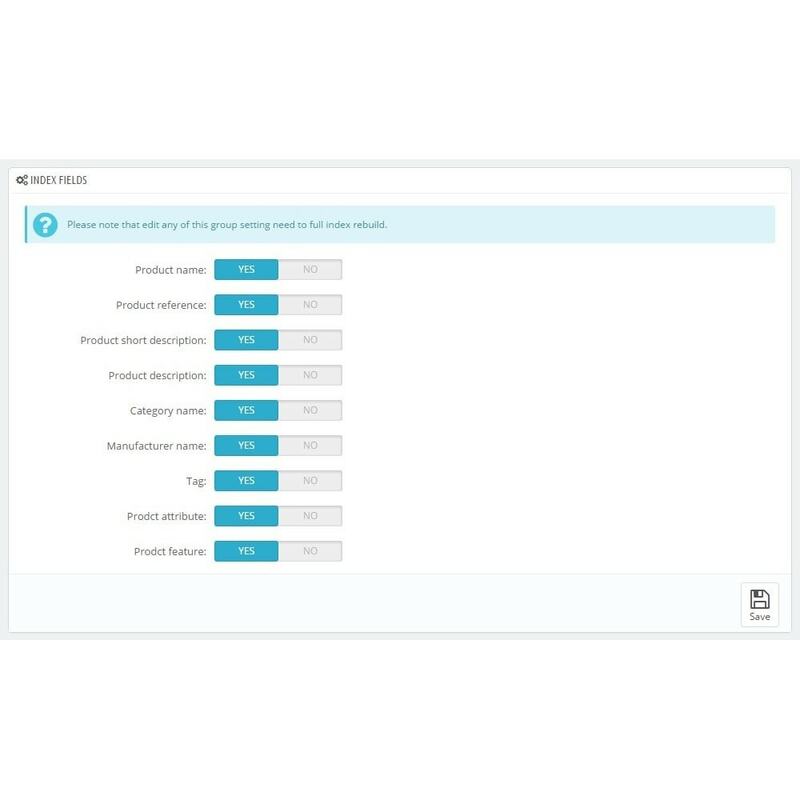 It can handle 100k+ products with great speed and allows tuning the search behavior depending on each merchant's needs. Please note file have to be accessible and writable. Please note that edit any of this group setting need to full index rebuild. - Disable or enable default PrestaShop search engine while ElasticSearch full index regeneration in progress. - Disable or enable advanced index configuration (only for advanced elasticsearch users). 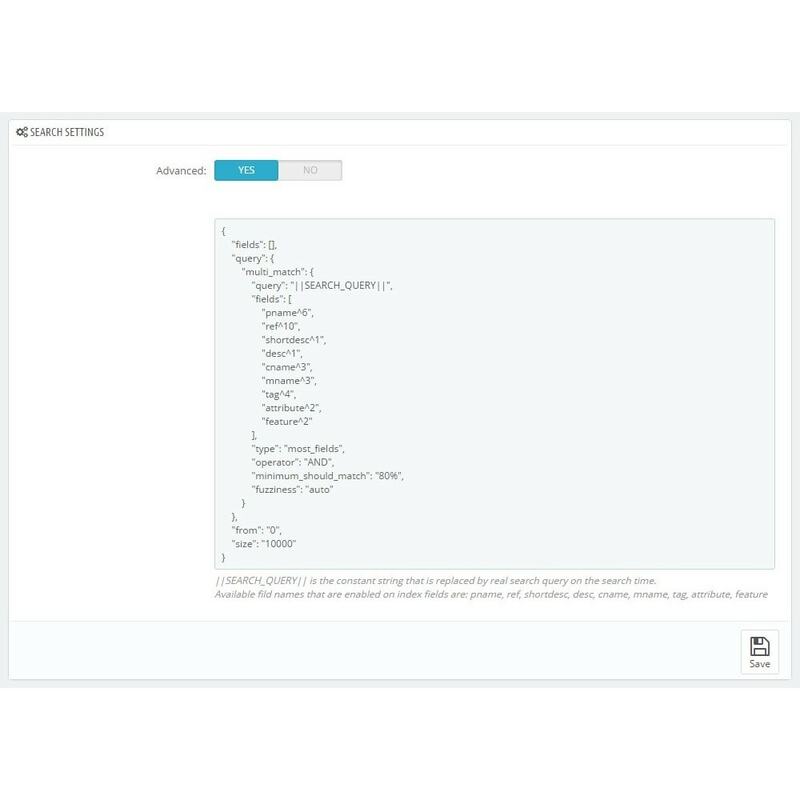 When enabled all fields from this part are hidden and textarea with json code is visible. You can configure here all available index features that elasticsearch server prepare for You. More about advanced index configuration can be find in elasticsearch server documentation. 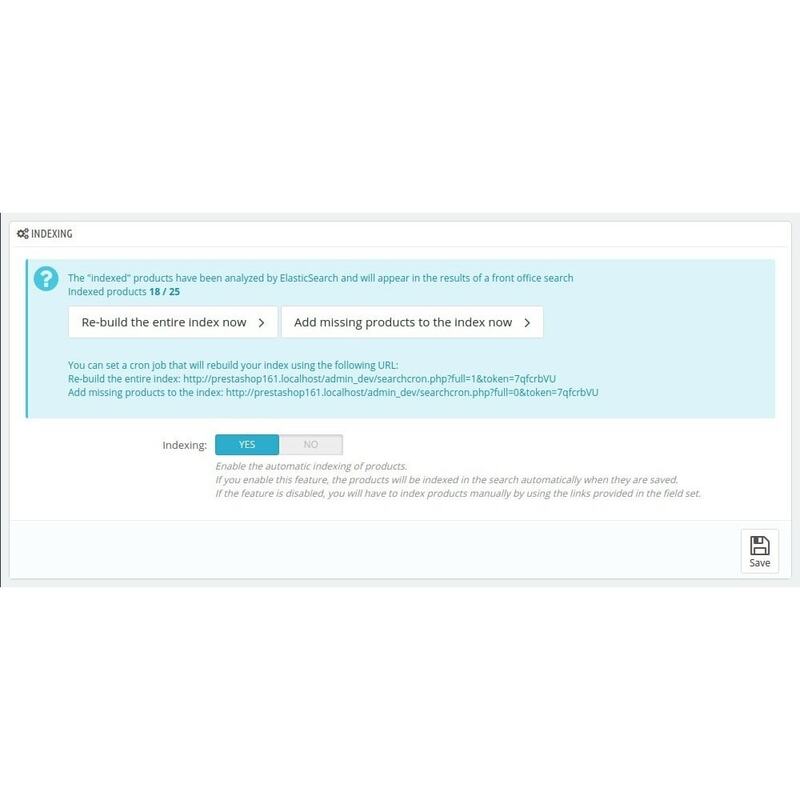 - Disable or enable advanced search configuration (only for advanced elasticsearch users). You can configure here all available search features that elasticsearch server prepare for You. You can find here interesting informations about indexation process. 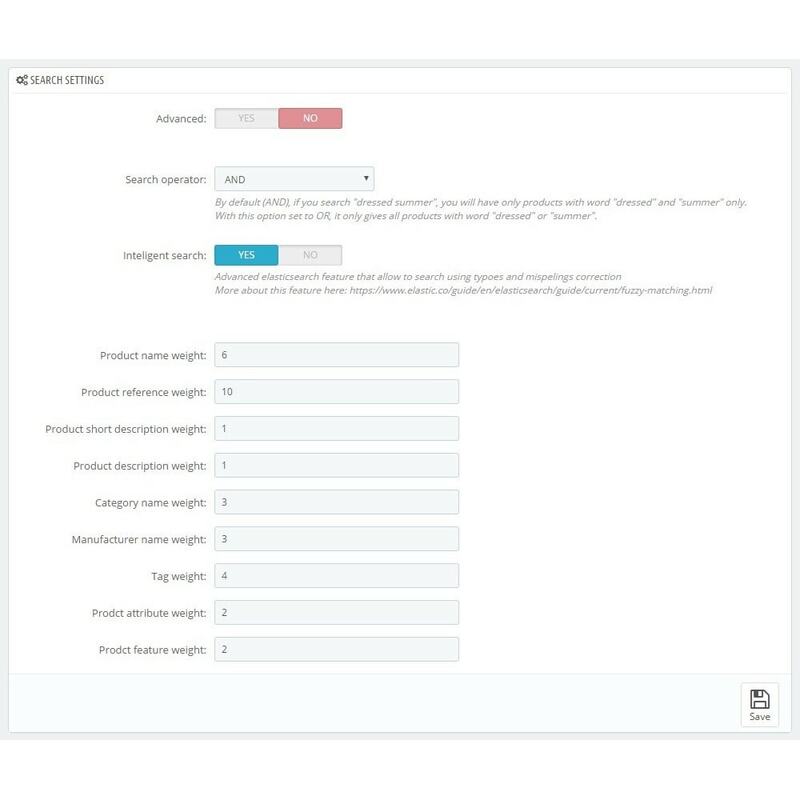 This section also give You buttons and links to rebuild entire index or add missing products to index. 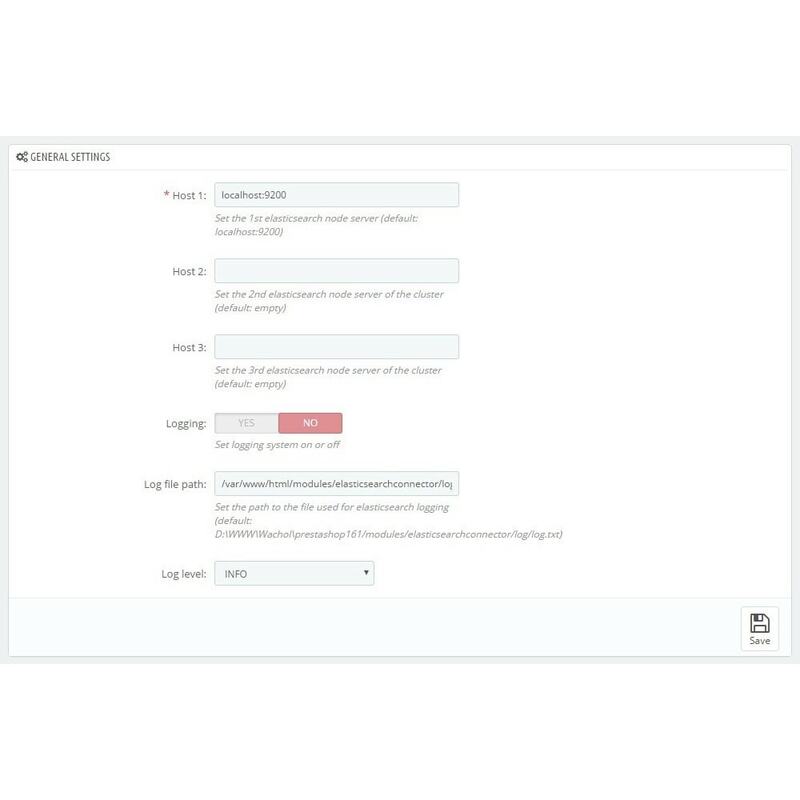 - This is core PrestaShop setting added to Elasticsearchconnector configuration to have all related settings in one place. It allow You to enable or disable automatic index update after each product save. Customers will get best matched products in most short time using powerfull text search server. When inteligent search enabled Your customers will get best matched products in case originally searched phase return 0 results. This feature will be very usefull for Your customers as it can fix mistakes done by them while they use search feature. - Please use default PrestaShop module installation scenerio. 4. Start full indexation process by click on the button "Regenerate now"
2016-07-30 10:22:31 +0100 Better result order by shingle filter use & switch to handle search via PS engine while ElasticSearch indexation in progress. 2016-08-10 11:21:53 +0100 Disable elasticsearch while full indexation and use default PS search engine. 2016-10-11 14:52:32 +0100 Add missing products to index, cron links for indexation. 2017-06-13 23:45:17 +0100 Supplier filed added to index and available for search. 2017-10-19 22:22:31 +0100 EAN13 filed added to index and available for search. 2018-01-15 19:41:19 +0100 Supplier reference filed added to index and available for search. 2018-07-02 22:01:43 +0100 Initial reindexation in background process. 2018-09-04 22:41:13 +0100 PrestaShop 1.7.4 support. 2019-02-07 21:14:03 +0100 Synonym support, cron url fix. 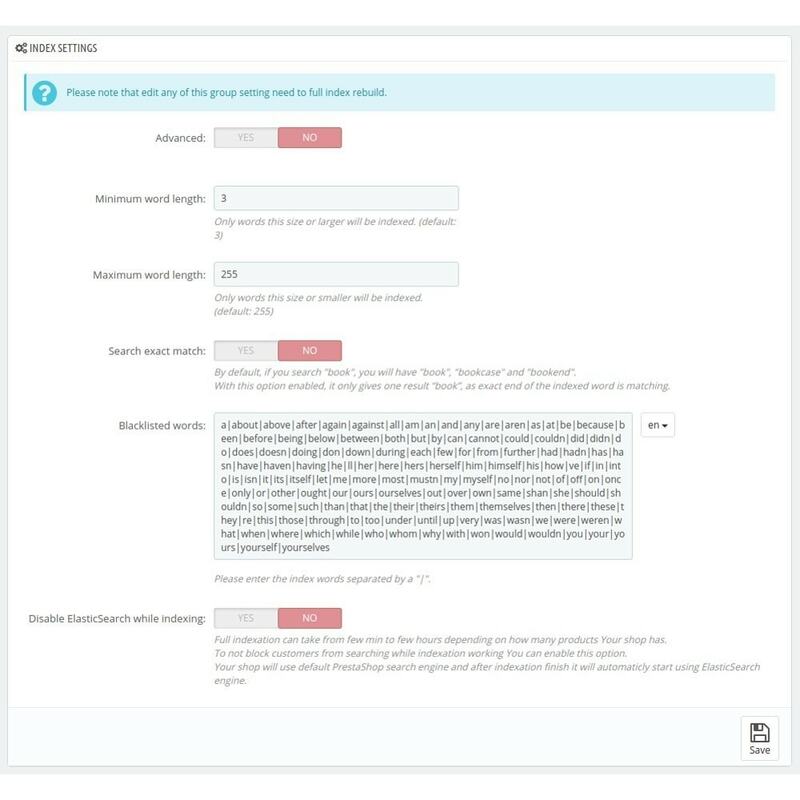 Extension des recherches qui améliore la recherche par défaut PrestaShop à travers l’élimination des résultats vides provoqués par des fautes d’orthographe ou de frappe.